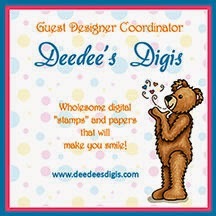 I love when a theme for a challenge is "Anything Goes"....and that's what our theme is this week at Eureka Stamps!! ANYTHING! Now personally I'm ready for spring so I decided that Spring should be in bloom on my blog today! I used Digi36303 – Spring Set of 4 but only used one of the 4 blocks. What a great bargain that set is - 4 images for the price of 1! I colored the image with Spectrum Noir markers and used an embossing folder by Darice to even bring more flowers to the card. Add a ribbon and instant card! With the theme Anything Goes you certainly can join me at Eureka Stamps this week....remember if you don't join us you can't win! Thank you for spending a few precious moments of your day with me. God bless you!!!! I like the multiple layers. I would not have thought to put yellow with lavender....looks great! Oh what a pretty card. Love the colors you used. Thanks for joining us at Created with love Challenges. What a beautiful floral card.... makes me even more ready for summer. Such a pretty card, Zella. TFS! Saw it on MIM. what a wonderful card Zella.